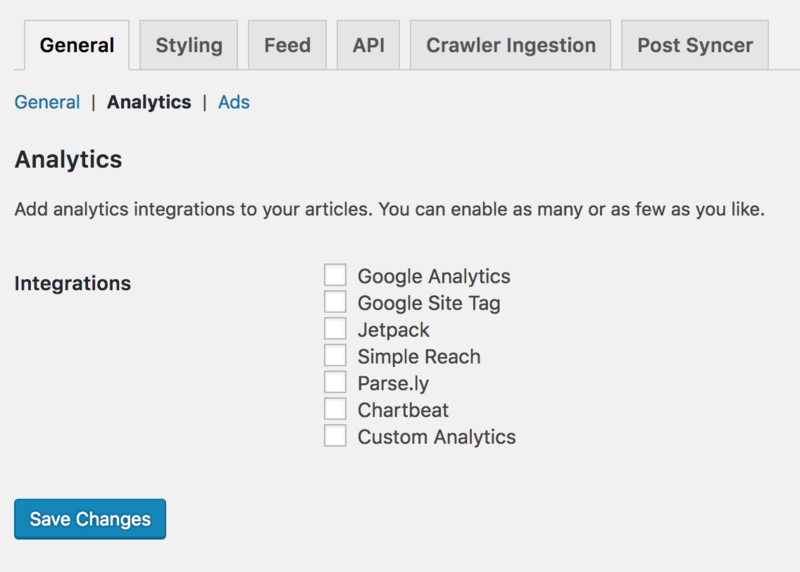 WP Native Articles can automatically add the correct tracking code for multiple Analytics services. Navigate to the Analytics sub menu and enable the services you wish to include. Once a service is enabled you'll be given the option to enter your custom ID for that service. You can enable as many services as you like. WP Native Articles will automatically work with the official WordPress plugins for all these services. If you have any of the official plugins active we'll use the settings from that plugin by default. The custom analytics box is a free form textarea, meaning you can add as many or as few analytics scripts as you like. They will automatically be wrapped in a <figure class="op-tracker"> tag to make them compatible for Instant Articles. As of v1.3.4 you can now use certain post placeholders in your Analytics code. For example, if you wanted to associated posts with your authors in Google Analytics and you'd set it up as dimension, you could add the following code to your Google Analytics.